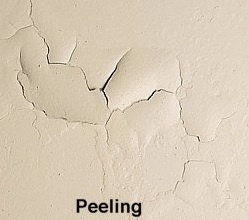 Repair your cracking and flaking walls. We’re assuming cracking and flaking were not the desired paint effects you were hoping for. Paint can either accent a room or become a glaring distraction when there is a mistake. Don’t let cracking and flaking become the focal point of an otherwise appealing room. Cracks can begin small, but don’t be fooled. They will grow and worsen with time if not properly treated. Cracking occurs when aged paint splits through at least one coat with flaking soon to follow. This occurs when old oil based paint loses adhesion, flexibility and becomes hard and brittle. Poor surface preparation, over-thinning, or overspreading paint beyond manufacturer’s recommendations is what leads to this unfortunate result. “Alligatoring” can occur in extreme cases when a second or third coat of paint is applied before the previous coat dries completely, or when the undercoat is incompatible with the finish coat. For example, never layer an oil-based paint over latex paint. Begin the fix by removing all loose paint with a scraper. Sand the surface and feather the edges. Spot prime areas to be repaired*. Spackle deep scars caused by cracking/flaking of multiple coats of paint and sand. Prepping and priming is the essential key for better adhesion, sheen uniformity, mildew control, and durability. Complete your work by topping it off with a quality Hirshfield’s interior paint in the color and sheen of your choice. * The reason to prime before repair is because the old surface is thirsty, and will pull the liquid portion out of your repair, causing a poor bond. Since Frank and Elizabeth Hirshfield opened his first store in 1894, it has been our mission to do the best job possible meeting customer needs and solving customer problems. Hirshfield’s. People and products you can trust.